Belize is still buzzing after partying this weekend with HRH Prince Harry of Wales, who arrived into the country on Friday for a couple of days as part of a Diamond Jubilee tour in honor of his grandmother, Queen Elizabeth II, who is celebrating 60 years on the throne. Here is a little round up of the highlights…. 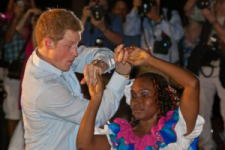 Highlights of Prince Harry’s tour included meeting hundreds of Belizeans at a bloc party in the administrative capital Belmopan, where he rallied the party after a speech with the words “Unu come mek we go paati!” a native Kriol dialect and rough translation being ‘let us go party!’ With lively performances by Garifuna, Mestizo and Creole groups, he shook hands, talked to children, samples local delicacies including an exotic cocktail called Hibiscus Punch, made from coconut and white rum….. and of course the mandatory sampling of the local Belikin Beer of Belize. Prince Harry also visited the ancient Maya Ruin of Xunantunich in the village of Succotz in the Cayo District, accessed via a hand cranked ferry over the Mopan River. Also known as the “Maiden of the Rock”, it is the second tallest Mayan ruin in Belize. It stands 130 feet high to give a panoramic view of the Cayo District, Guatemala and the Mopan River. The prince proudly presented a special hand carved wooden canoe to the Belikin team competing in the 2012 Ruta Maya, a grueling multi-day canoe race traveling across the country. The dugout canoe was a beautifully crafted water vessel that included the special emblem of the Queen’s Diamond Jubilee. Prince Harry explained that the best memory he is taking is of the people of Belize. “The welcome I received, it feels like I have been here for a week. The music, the people, the culture is incredible.” He said he is looking forward to visiting Belize on a vacation hopefully “not with all the cameras”.